The particular mechanism with which the body naturally breaks down and prevents infection from lethal infections including Ebola, HIV, HCV and SARS has gradually emerged. The mechanism is called mannose-binding lectins. Mannose-binding lectins are apparently produced in the human body via a DNA sequence, called the MBL2. When this part of our genes is in order, the body will produce and release these mannose-binding lectins into the bloodstream. Mannose-binding lectins will then recognize and glom onto certain carbohydrate molecules that cover and make up various microorganisms. These include fungi, bacteria and even parasites, which utilize glycoprotein shells to protect themselves. But they also include viruses. Once the lectins attach to these shells, they will break apart the surface of the microbe and basically break them down, allowing the body’s other immune cells to kill off the microbe and prevent it from replicating. In fact, a healthy body that produces good levels of these mannose-binding lectins will be able to easily fight off colds and flus, as well as other microbial infections. Several animal studies have shown mannose-binding lectins heartily beat down coronaviruses and infectious bronchitis. Research over the past five years has found that low levels of mannose-binding lectins increases the risk of respiratory infections, including syncytial virus infections, pneumonia and others. For example, in a study of 121 children, RSV-infections were associated with low levels of mannose-binding lectins. Nearly 70 percent of RSV-infected children had low levels of mannose-binding lectins. But other infections – especially those related to bacterial infections – are not necessarily connected with mannose-binding lectin levels. When it comes to virulent infections such as Ebola, Hepatitis C and HIV, however, these are different. These viruses come with glycoprotein shells that protect the virus from being broken down. Furthermore, the glycoprotein shell of the Ebola virus produces glycoproteins that damage cells, allowing the virus to penetrate and replicate within the cell. Mannose-binding lectins actually break down this shell and the glycoprotein matrix through a mechanism called the lectin pathway. Humans that don’t produce enough of these mannose-binding lectins are not only more susceptible because they don’t have enough lectins, but they are typically also immunosuppressed with regard to the rest of their immune system. This brings us to the fun part. Yes, humans aren’t the only critters that produce mannose-binding lectins. Red algae also produce these profusely, which allow the algae to protect themselves from invasion by viruses. The most promising form of mannose-binding lectins is a component of the Scytonema varium red algae called Scytovirin. The protein extract was isolated by researchers from the National Cancer Institute at Frederick, Maryland in 2003. The protein contains 95 amino acids, and was found to bind to HIV-1 viral shells. A similar antiviral protein was found in Nostoc ellipsosporum – called Cyanovirin-N. Both of these antiviral proteins did similar things – they broke down the glycoprotein shells of HIV and HCV. 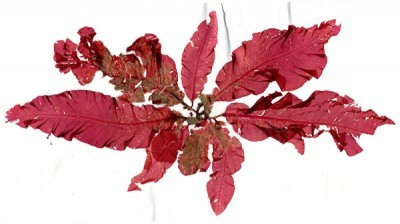 Yet another anti-viral extract was found from the New Zealand red alga species, Griffithsia sp. This protein is called Griffithsin, abbreviated with GRFT. Over the next few years, Griffithsin was tested against HIV-1 with great success in laboratory studies, which included studies with mice. The epidemic-potential virus SARS was also tested against Griffithsin, also with great success. Multiple studies illustrated these effects. Research from the Center for Cancer Research in Frederick, Maryland found that Griffithsin not only stopped HIV-1 virus replication, but stopped cellular intrusion of the virus. In 2010 Harvard researchers tested a recombinant version of Griffithsin – called rhMBL – against Ebola. Once again, they found the mannose-binding lectins were able to not only breakdown the viral shells of the Ebola, but when given to mice infected with Ebola, the mice became immune to the virus. Yes, when the mice given the recombinant mannose-binding lectins were rechallenged with the Ebola virus, they were found to be immune to the Ebola virus. Since that study other research has tested other animals with Griffithsin, with similar results. As modern medical researchers continually strive for isolated and synthesized versions of nature able to be patented, recombinant versions of Griffithsin were eventually produced using Nicotiana benthamiana plants (a relative of the tobacco plant). These plants were genetically modified so they would produce the same mannose-binding lectins. This form of Griffithsin was tested on mice and guinea pigs infected with HIV-1, with successful antiviral results. This was also found when testing the recombinant Griffithsin on Ebola-infected mice. In all the studies, the Griffithsin was found to be safe and tolerated. So the most logical answer is “yes” – certainly consuming red algae in supplement form has been found to boost antiviral immunity, and from the available research, blood levels of mannose-binding lectins. This should in turn boost immunity and create a natural method of preventing and even treating viral infections such as Ebola, SARS, HIV and Hepatitis-C.
Of course, this strategy should be used with other natural immunity-boosting strategies. Other plants also produce these mannose-binding lectins, some of which have been used in traditional medicines. A study from Belgium’s University of Leuven studied 33 different plant lectins, and found 10 different mannose-binding lectins among the plants that inhibited coronovirus, and intervened upon the replication cycle of SARS-CoV. Consult with your health professional if you are sick. Baize S, Leroy EM, Georges-Courbot MC, Capron M, Lansoud-Soukate J, Debré P, Fisher-Hoch SP, McCormick JB, Georges AJ. Defective humoral responses and extensive intravascular apoptosis are associated with fatal outcome in Ebola virus-infected patients. Nat Med.1999 Apr;5(4):423-6. Albert RK, Connett J, Curtis JL, Martinez FJ, Han MK, Lazarus SC, Woodruff PG. Mannose-binding lectin deficiency and acute exacerbations of chronic obstructive pulmonary disease. Int J Chron Obstruct Pulmon Dis. 2012;7:767-77. doi: 10.2147/COPD.S33714. Ribeiro LZ, Tripp RA, Rossi LM, Palma PV, Yokosawa J, Mantese OC, Oliveira TF, Nepomuceno LL, Queiróz DA. Serum mannose-binding lectin levels are linked with respiratory syncytial virus (RSV) disease. J Clin Immunol. 2008 Mar;28(2):166-73. Barton C, Kouokam JC, Lasnik AB, Foreman O, Cambon A, Brock G, Montefiori DC, Vojdani F, McCormick AA, O’Keefe BR, Palmer KE. Activity of and effect of subcutaneous treatment with the broad-spectrum antiviral lectin griffithsin in two laboratory rodent models.Antimicrob Agents Chemother. 2014;58(1):120-7. doi: 10.1128/AAC.01407-13. Takebe Y, Saucedo CJ, Lund G, Uenishi R, Hase S, Tsuchiura T, Kneteman N, Ramessar K, Tyrrell DL, Shirakura M, Wakita T, McMahon JB, O’Keefe BR. Antiviral lectins from red and blue-green algae show potent in vitro and in vivo activity against hepatitis C virus. PLoS One. 2013 May 21;8(5):e64449. doi: 10.1371/journal.pone.0064449. Mori T, O’Keefe BR, Sowder RC 2nd, Bringans S, Gardella R, Berg S, Cochran P, Turpin JA, Buckheit RW Jr, McMahon JB, Boyd MR. Isolation and characterization of griffithsin, a novel HIV-inactivating protein, from the red alga Griffithsia sp. J Biol Chem. 2005 Mar 11;280(10):9345-53. Bokesch HR, O’Keefe BR, McKee TC, Pannell LK, Patterson GM, Gardella RS, Sowder RC 2nd, Turpin J, Watson K, Buckheit RW Jr, Boyd MR. A potent novel anti-HIV protein from the cultured cyanobacterium Scytonema varium. Biochemistry. 2003 Mar 11;42(9):2578-84. Michelow IC, Lear C, Scully C, Prugar LI, Longley CB, Yantosca LM, Ji X, Karpel M, Brudner M, Takahashi K, Spear GT, Ezekowitz RA, Schmidt EV, Olinger GG. High-dose mannose-binding lectin therapy for Ebola virus infection. J Infect Dis. 2011 Jan 15;203(2):175-9. doi: 10.1093/infdis/jiq025. Vorup-Jensen T, Sørensen ES, Jensen UB, Schwaeble W, Kawasaki T, Ma Y, Uemura K, Wakamiya N, Suzuki Y, Jensen TG, Takahashi K, Ezekowitz RA, Thiel S, Jensenius JC. Recombinant expression of human mannan-binding lectin. Int Immunopharmacol. 2001 Apr;1(4):677-87. Singh RS, Thakur SR, Bansal P. Algal lectins as promising biomolecules for biomedical research. Crit Rev Microbiol. 2013 Jul 16. Keyaerts E, Vijgen L, Pannecouque C, Van Damme E, Peumans W, Egberink H, Balzarini J, Van Ranst M. Plant lectins are potent inhibitors of coronaviruses by interfering with two targets in the viral replication cycle. Antiviral Res. 2007 Sep;75(3):179-87.